Here’s is a quick step by step tutorial to make it 5×5. So you can get 25 icons in your screen and app drawer. You can view more icons in the same page which is better if you have so many apps. Sometimes it is time-consuming to go through all the screens to find a specific app. Let’s get started. Step 1: Press and hold on any empty area on your home screen. It will bring up some options to change the visual settings. Step 2: Click on Screen grid. It will give you 3 options. Step 3: Select 5×5 from the option and click “Apply“. 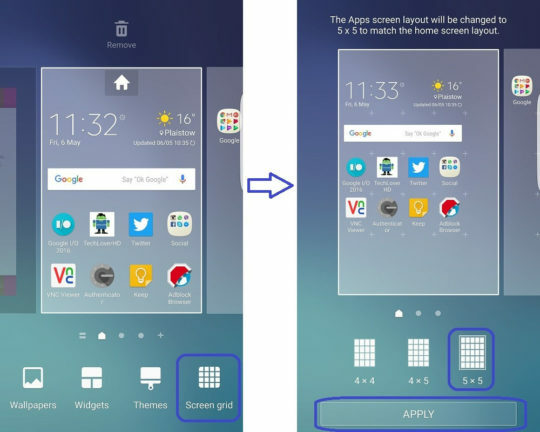 Now, you will have more room on your Galaxy S6 Edge’s screen. If you had any widget on any home screen, probably their size has changed too. You can resize them easily by following the next steps. Step 1: Press and hold on the specific widget on home screen and release it once you see it moved from its space. Step 2: You will see two blue dots. Press on the dot and drag it to increase / decrease the size. Some widgets may have 4 dots, that will allow you to increase the size horizontally and vertically. This should work with any Galaxy S6, Galaxy S6 Edge running either on Android 5.1.1 Lollipop or Android 6.0.1 Marshmallow.